As Thanksgiving approaches, I find myself wondering how our ancestors celebrated an old fashioned Thanksgiving. From the beginning of time, Thanksgiving meant food and family. A time to celebrate the summer harvest and prepare for a long winter. Pantries were full, barns were stocked and families were anxious to sit back and enjoy some time together after a long working summer. Here on our farm, I like to think we celebrate the same way. We spend the day together being thankful for the harvest and all the blessing the Lord has given to us throughout the year. Over the last few years, I’ve been making Thanksgiving a little more old fashion. I’ve been concentrating more on the day and not so much on the activities that surround Thanksgiving. Long gone are the days of preparing for Black Friday, all day spent watching football, or making a feast only a King’s Court could eat. Now I make sure we put our focus on the simpler side of Thanksgiving…centered around God, nature, and family. Simple Menu – Thanksgiving dinner does not have to be a feast fit for a King. I have taken the stress out of dinner by serving the same simple menu for years. Turkey – Dressing – Mashed Potatoes & Gravy – Sweet Potatoes, Cranberry Sauce, Coleslaw, and Pumpkin & Chocolate Pie. Centerpiece – The day before Thanksgiving I take a walk around the farm and fill a basket with things I find in nature. Pinecones, fall leaves, dried grapevines, holly berries, dried corn and anything else I can use in a centerpiece. A Time for Prayer & Reflection – At the start of our meal a pray of thanks is given. We tell the Thanksgiving story just like we do with the Easter story. We have nine people in our family so I cut out nine turkeys from construction paper and write one of these key Thanksgiving history points on each. I also use them as name settings, I write each person’s name on the front and write the history point on the back. After our prayer, we go around the table and read each point in date order. Turkey #1 – In 1620, the Mayflower came ashore in the New World. Turkey #2 – In 1621 Thanksgiving was held as a three-day feast to celebrate the first harvest and to thank the local Indians that had helped them to survive their first year in Massachusetts. Turkey #3 – In 1623, the Plymouth colony had a terrible drought and they prayed for rain. After the rains had come, they celebrated Thanksgiving with a day of prayer. Turkey #4 – In 1676, the governing council of Charlestown, Massachusetts, proclaimed a day of thanksgiving on June 29, to express their thanks for the good fortune their community had securely established. Turkey #5 – In 1777, all 13 colonies celebrated Thanksgiving for the first time; however, it was a one-time affair commemorating a victory over the British at Saratoga. Turkey #6 – In 1789, George Washington proclaimed November 26th to be a national thanksgiving day for adoption of Constitution. Turkey #7 – In 1846 Sarah Hale begins advocating a national Thanksgiving celebration, believing this spiritual means would unify and preserve the nation. Turkey #8 – In 1863 President Lincoln, declared the last Thursday of November to be set aside as a “day of Thanksgiving and Praise”. Turkey #9 – In 1941, Congress changed the holiday permanently to the 4th Thursday of November. Gathering – Thanksgivings of the past did not include TV’s to gather around. Instead, families sat around the fire telling stories and sharing laughter. Passing down family stories is becoming a Thanksgiving tradition in our family. Savor the Moment – As I get older I tend to stop and savor the moments of life more often. I have found myself more than once sitting at my table surrounded by my children just listening to their voices, watching their faces and catching their smiles. Thanksgiving is all about being thankful and what a better way than to sit back and savor the moment of a holiday dinner. Turkey Trot – At the end of the day, and before everyone heads home we take a family walk. It is the perfect way to tucker those little ones out and work off that pie. How does your family celebrate Thanksgiving? 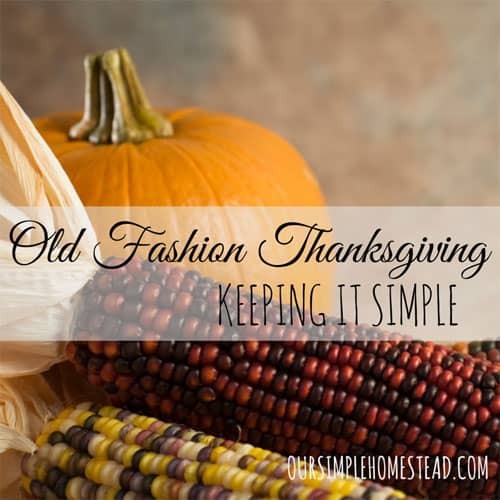 Do you have any old fashion Thanksgiving traditions? P.S. Do you like what you are reading? 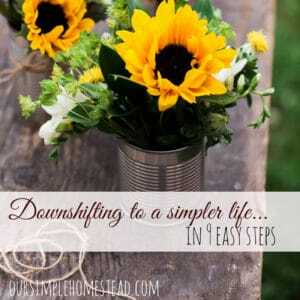 Are you looking to slow down and live a simpler life? 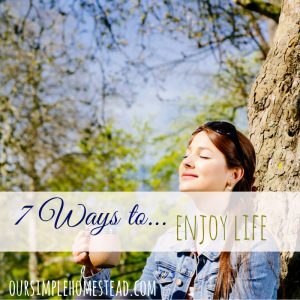 I am so happy you’ve landed here and I can share some of the simple living principles that have made a huge difference in our lives. 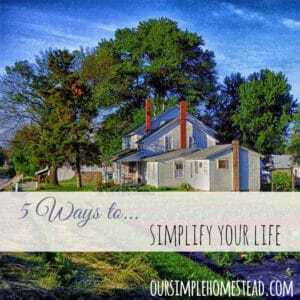 To give you a place to start I have created a “5 Steps to Simple Living Guide“ that I am offering to you free. 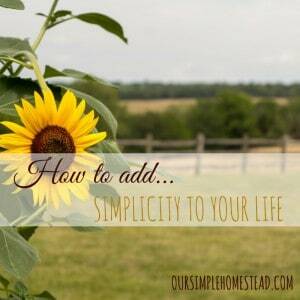 Along with this free download, is included a complimentary subscription to our weekly Our Simple Homestead Newsletter. 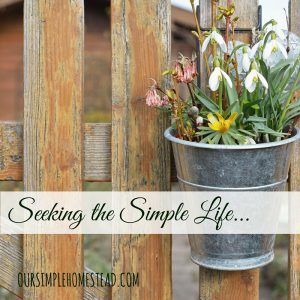 Each week you’ll receive simple living tips, homesteading ideas, old-fashion recipes and every once in awhile a touch of the Amish lifestyle. 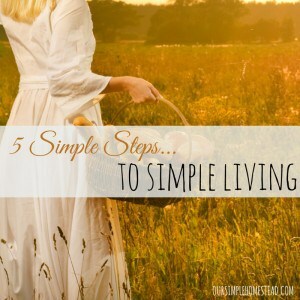 Click here to receive your free download of 5 Steps to Simple Living today! DISCLOSURE: In order for me to support my blogging activities, I may receive monetary compensation from affiliate and sponsored posts on this blog. 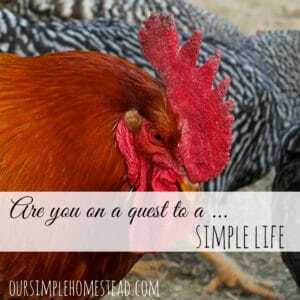 Are You on a Quest for a Simple Life? Thank you for some of these wonderful simple ideas. I hope to use some of them this year with our extended family. Holidays for us were getting way out of hand a few years ago, and my whole family is so happy that I have brought them back to what they are suppose to me like. Enjoy your holidays! Switch the cole slaw for peas and that’s our dinner! Thanksgiving is my favorite holliday. Thanksgiving is my favorite stress-free holiday as well! I love the idea of a simple Thankgiving. With just my parents, siblings and their kids we total to about 20 and it gets crazy. I only have 9 in my family so we are small but it still was getting crazy, but the last couple years have been wonderful since we adopted this laid back approach to the day! Just yesterday I was talking to my oldest daughter about what Thanksgiving traditions we should implement for our family now that we had returned to the States. Thanks for the ideas. You are very welcome Helene! It is all about the holiday and remembering why we are celebrating the day! I love your thoughts about Thanksgiving. It is wonderful that you go into it prayerfully and with purpose. Thank you for including the historical facts. I found you on Motivation Mondays. Thanks Heather…I have been trying real hard to concentrate on the holiday instead of everything that normally surrounds a holiday, like shopping and spending money! To me that is what holiday’s are all about! Thanks Meaghan…I know when I lost all of my grandparents life changed. I no longer looked at life the same way again when those around me started to pass away. I don’t tale life for granted any longer and make the lost of every day! Thanks for the feature Carrie! I have been trying real hard to simplify our holidays and we enjoy them so much more now. Awesome simple tips. I specifically like the Gathering point where everyone sit and share family stories.How fun! . Thank you for linking up at Home matters link up party. We would love to meet you again next Wednesday. Sharing stories is my favorite part about our holidays! I have learned so much from my adult children that I would have never learned if we didn’t spend this quality time together. Thanks Angie I will go check it out! Thanks for visiting!! I am visiting from the Frugal Friday Link Up Party. Before my grandmother passed away.. All of the woman..moms, daughters, aunts, cousins, all joined in making a huge feast for our families. It took a lot of time but all the woman got to spend quality time together and catching up on things that had happened since Easter. Janell when I was growing up we had huge Thanksgiving dinners at my grandmothers house…it was confusing and loud but there was always laughter in the kitchen from all my aunts gathering to cook the meal. Those are special memories for me. Like you it was normally months between visits so they had so much to talk about. I am sure the laughter was coming from the hidden wine glasses, but as a child I didn’t realize that then I just thought they had a lot to laugh about! Cathy as I get older I find myself wanted to just listen to the things that my children and grandchildren think about and I love all the memories we share…it really makes the day special for me. We keep it simple here too. I do most of the cooking, we eat around 2 pm, and then sit around and talk. Everyone usually goes back home around 5. Of course, we all live in the same town, so we see each other almost daily – not really any catching up to do! It is so refreshing to hear other families like to keep their holidays simple as well! I love your idea of reflecting on Thanksgiving as a family. We try to keep ours simple, too. Of course, we have a larger family and do it pot luck style, so that makes it pretty easy on everyone. Hi Tracy, we celebrate Thanksgiving simply as well. Our dinner is similar to yours down to the pumpkin and chocolate pie but we have a veggie tray that comes out during football. While we watch the games they aren’t the focal point of the day. We play board games and let the little ones put on shows for us. Thanksgiving is my favorite holiday because it is so laid back and about family. I’d love to take a walk in the evening but we usually have quite a bit of snow. Makes me look forward to the day when I know it is not going to be stressful. So happy to hear others feel the same way. Thank you so much for sharing the way you celebrate Thanksgiving! Hidden away in Central South Carolina is a little farm where we call home. 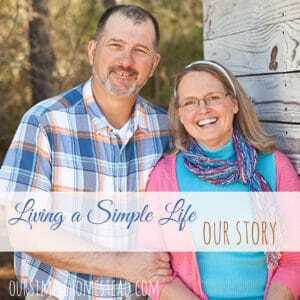 Surrounded by pine trees, chicken farms, and lots of sandy soil we live a very simple lifestyle by the grace of God. 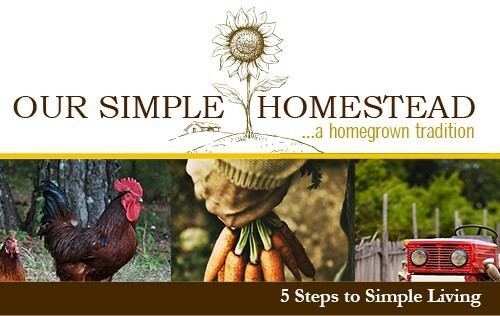 Our Simple Homestead is a participant in the Amazon Services LLC Associates Program, an affiliate advertising program designed to provide a means for sites to earn advertising fees by advertising and linking to amazon.com. It's on it's way! Check your email. 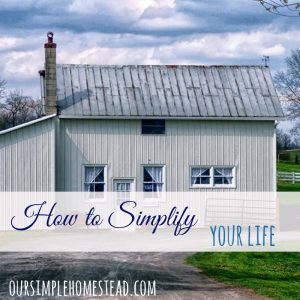 Along with this free download, we include a complimentary subscription to our weekly Our Simple Homestead Newsletter.